What the Heart Wants is the first museum exhibition of Belgian-American artist Cécile B. Evans in the Netherlands. Her eponymous video work was premièred last month during the Berlin Biennale, where it was applauded by critics as one of the absolute highlights. For her exhibition, Evans is transforming the second floor of De Hallen Haarlem into an immersive environment for her visually provocative narrative concerning the lead HYPER. Alongside What the Heart Wants, the installation Working On What the Heart Wants is also on view, which provides a glimpse – through a livestream – of the artist's working process. In 2014, the museum presented the exhibition The Common Sense by Melanie Gilligan, a project portraying a sterile yet terrifying future scenario concerning comparable themes. In the recent group exhibition Inflected Objects, guest curator Melanie Bühler zoomed in on the status of objects in a networked world. Just like these preceding presentations, What the Heart Wants offers a perspective based on the visual arts on existential questions involving purpose and providing meaning in a globalised and hyper-technological world in which there infinite opportunities and desires can be addressed in an instant. Evans’ work focuses on the relationship between humans and technology, and its increasing impact on the feelings that are exchanged and carried between them. Whether this is as simple as the interfaces and personal devices we use every day to the complications of being exposed to an overwhelming amount of information- the world of What the Heart Wants imagines what it could mean to be human in a future where unlimited power is given to one of the companies that controls these facets of our lives. This company, which has evolved to take human form as a woman named HYPER, seeks to shape humanity for its greater good but inevitably encounters divisive questions like, in this case asked by a pair of partially animated “lovers”- who gets to be a person? The mediation of technology is used as plot device to access eternal, exhaustive questions about race, gender, love, death, privilege, and human rights. 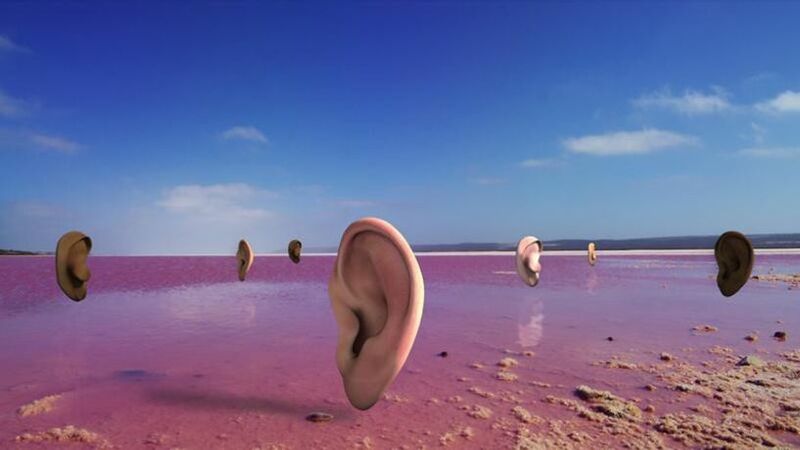 Using reality to create fiction, HYPER exists in a world which blends digital and organic locations that anecdotally (through references to events that are both recent and historical) resembles our present world – moving through her modernist house on a cliff, a server farm, to a pink lake populated by a worker’s collective of ears. HYPER is a digital Icarus, crashed down from the cloud, searching for her soul and meaningful solutions. The film What the Heart Wants was co-produced by the Frans Hals Museum | De Hallen Haarlem, and will be purchased by the museum for its collection.